The random number generator chose Animal Crossing! Yay! Animal Crossing is a weird sort of game. Its premise is that you are a human who moves into a town inhabited by cartoon animals. There isn’t an explicit goal to the game except to have fun living in the town. 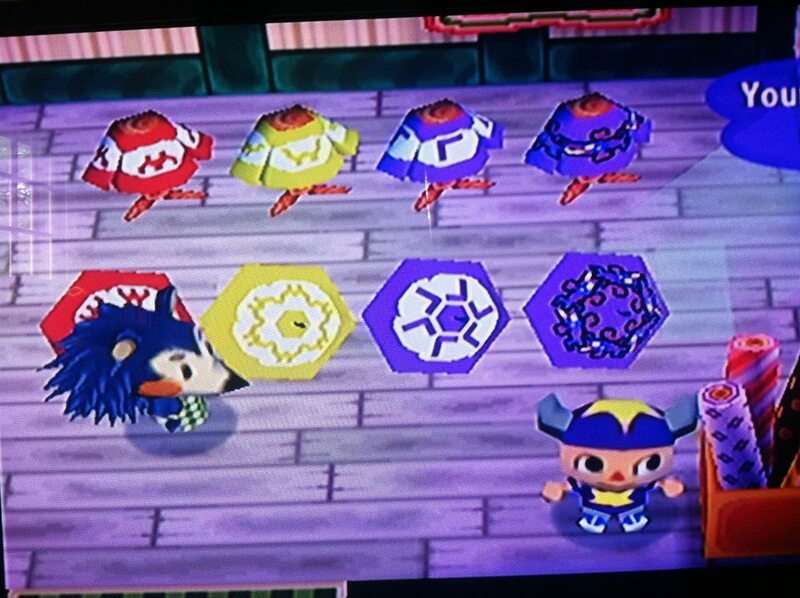 What makes the game special is the use of the GameCube’s internal calendar to make things happen in your town based on the passage of actual days in real life. 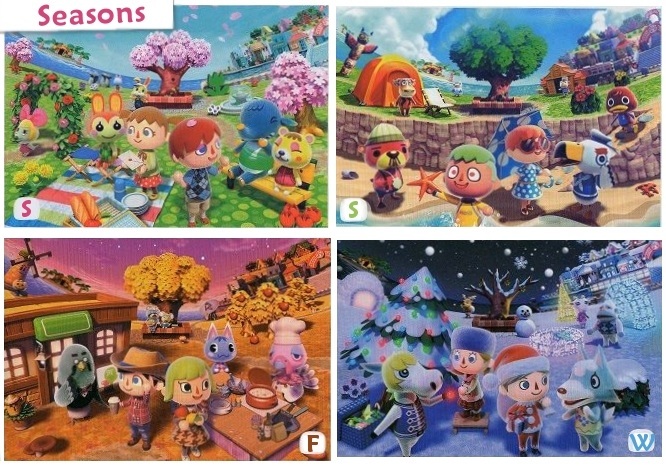 For example, Animal Crossing games have different things happen in different seasons. 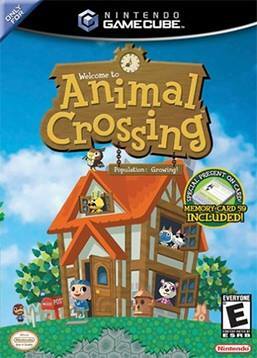 Animal Crossing is one of the games I played a lot of when I was in Middle School. I couldn’t tell you for sure how I originally heard about it, but my friend Jonah was the first to play it, and he was also the first among the people I knew who had a Nintendo GameCube. He doesn’t remember much about that time, but I do. 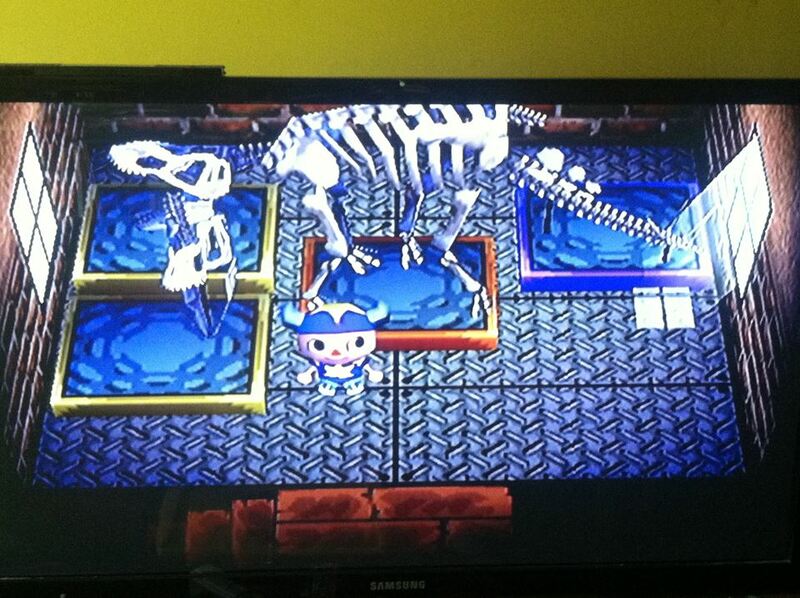 I started playing Animal Crossing as one of the villagers in my friend Jonah’s town. That’s when I learned to like the game. 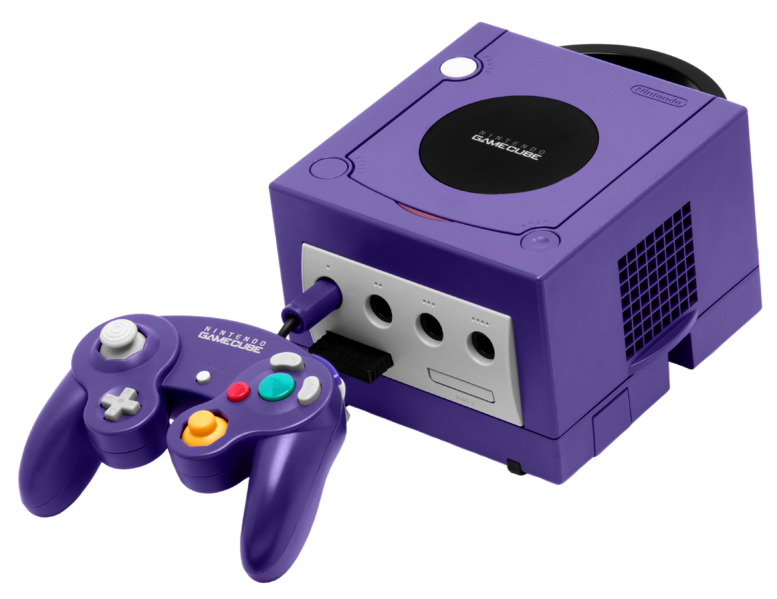 Jonah says it was one of the only GameCube games he had at the time, which might explain why we played it so much. I often sold oranges to the store, but I liked using the shovel much better. 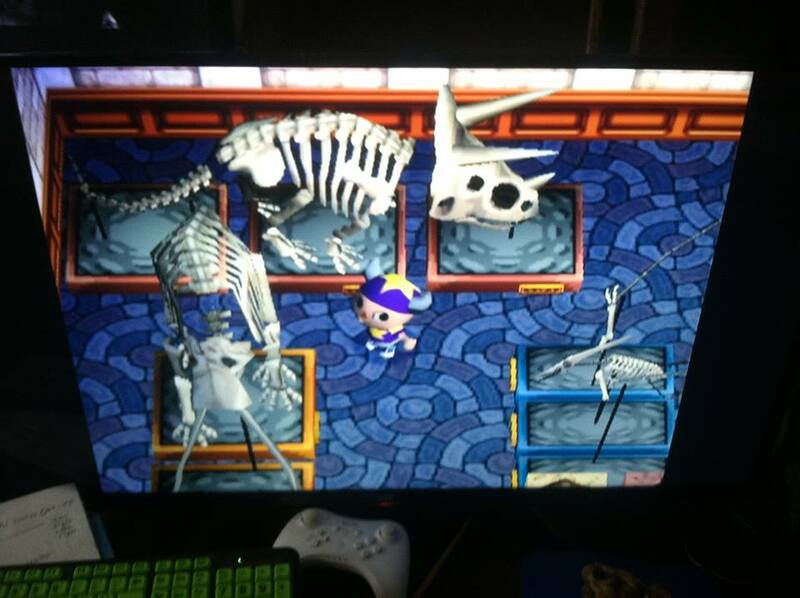 Each day I played, I’d dig up any fossils and Gyroids I found and donate the fossils to the local museum after getting them identified via mail. If the museum already had the type of fossil, I’d sell it to the store for some good money. I always saved the Gyroids I found instead of selling them, because I was hoping to possibly complete a collection of every Gyroid. 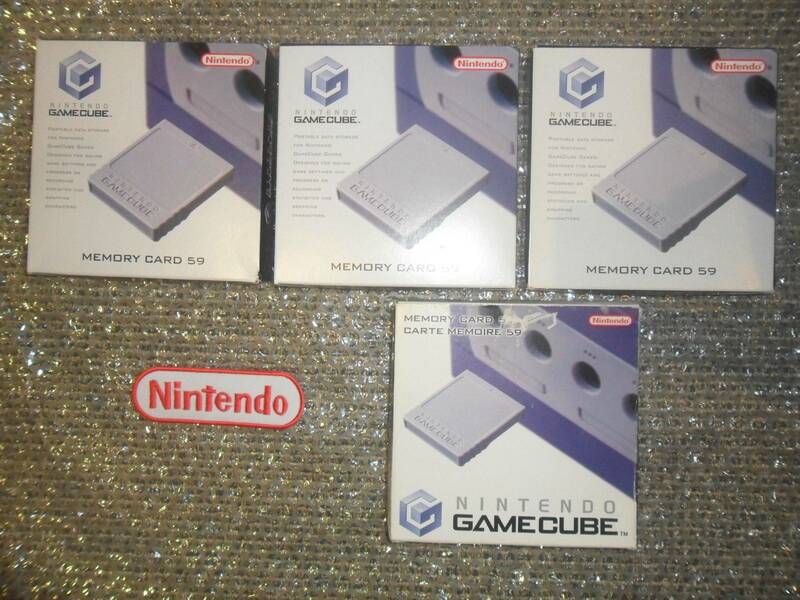 I knew which ones existed because I had Jonah’s guide to the game that listed every item. I’m not sure if the internet would have been able to help me back then, but I wasn’t obsessed enough with the project to bring it to completion. 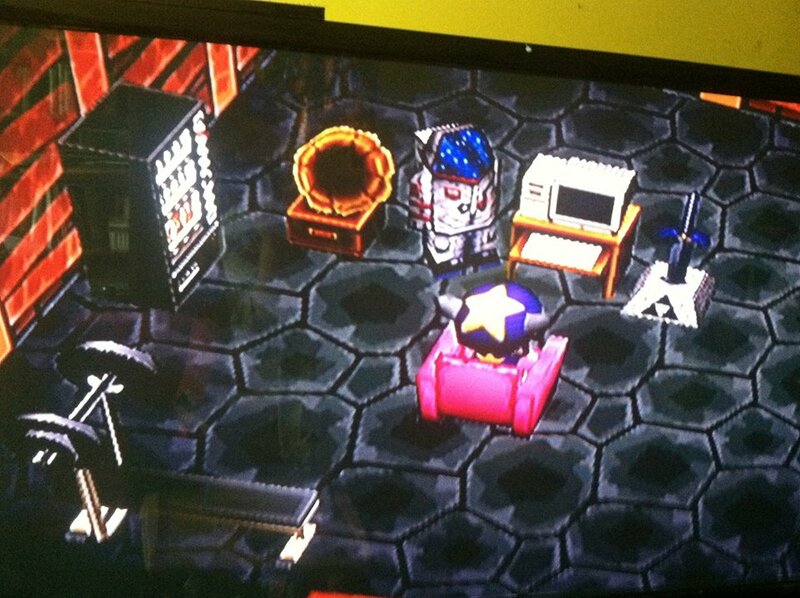 One interesting thing about Animal Crossing was its inclusion of certain NES games that your character can put in his/her house and play. It was cool because it offered the player a substantial reward for finding a virtual object in the game. Villager’s first game was also his first crossover game with Little Mac. 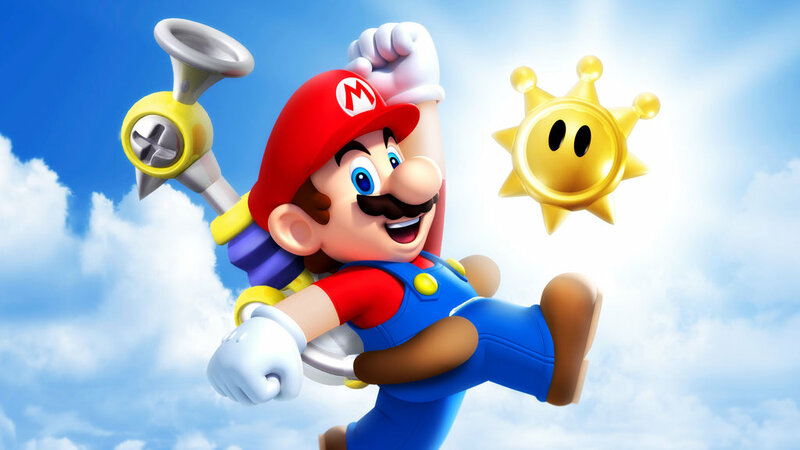 Another game Jonah had around this time was Super Mario Sunshine. 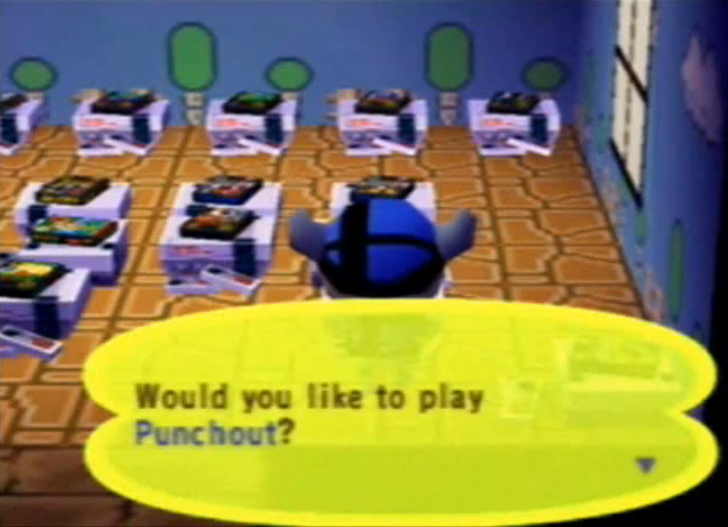 Unfortunately, as both Animal Crossing and Super Mario Sunshine are single player endeavors on the one GameCube and TV we had, only one of us could play at a time. Funnily enough, when I was really into Animal Crossing, Jonah mostly wanted to play Super Mario Sunshine, and when I finally wanted to focus on Sunshine Jonah was back into Animal Crossing. This sort of thing can happen with obsessive personalities like my own. 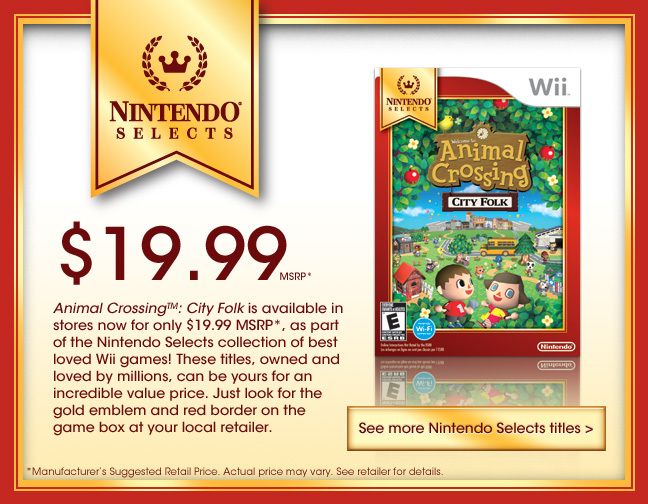 Animal Crossing allows one town to be stored per memory card. The great thing about having a game like this on a disc is that you are only limited in the quantity of towns by the number of memory cards you have, as opposed to games like Pokémon that only allow one file to be saved per game cartridge. Sometimes, I just don’t know where to stop. 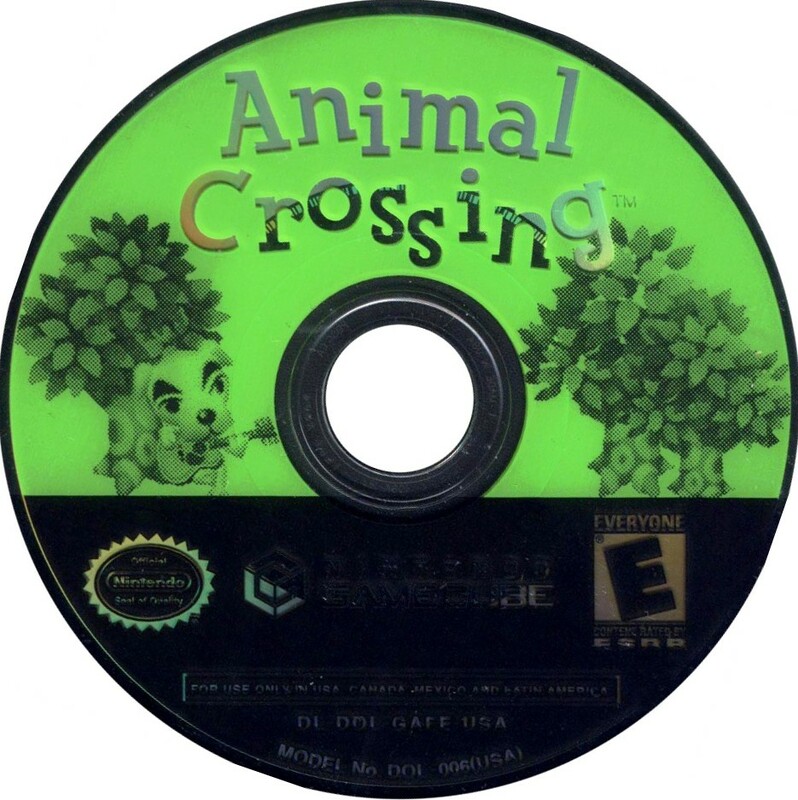 When I finally got a GameCube on Christmas of 2002, I borrowed Jonah’s copy of Animal Crossing, because he was completely done caring about the game. I then proceeded to build towns on different memory cards to help my overall progress, but my strategy wasn’t refined enough to work as effectively as it could have. I did know that an Orange sold in a town that started with oranges fetches 100 bells while its selling price in a town without oranges is 500 bells, so I used my GameCube’s second memory card slot to move between towns, bringing my town’s fruit to sell in the other towns and picking foreign fruit and bringing it back to sell it in my own town, but I could have easily replaced the fruit trees growing in my own town with foreign fruit trees which would have made paying off my loans a lot faster, but I was too afraid of messing up my town by chopping down existing trees because I didn’t have a clear idea concerning why some trees grew and others did not. I was also more focused on the immediate results of selling the fruit rather than the investment of planting it. 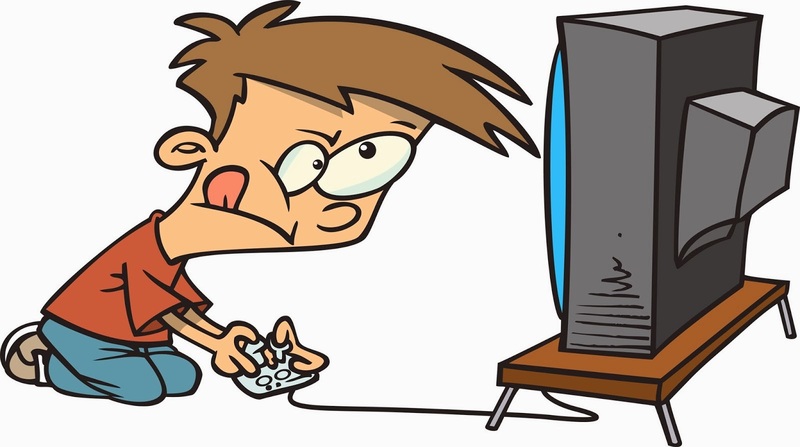 At that age, my brain had a lot more development to undergo before I could really be good at video games. I traveled so much between my 5 towns that at one point I actually had 2 of the same animal villager (Fang) in one of my towns. I didn’t take a picture of it because it happened a long time ago before I started taking pictures of interesting things. Although I lack solid evidence I’m pretty sure it did happen. What caught my imagination about Animal Crossing was its customizability. In this picture from my old town, you can see that I made shirts themed on Mario Wario Waluigi and the Pokémon Kyogre. You can see that even back then, I was a big fan of rain, both in the game and out. I wasn’t against changing the date in the game to suit my purposes. 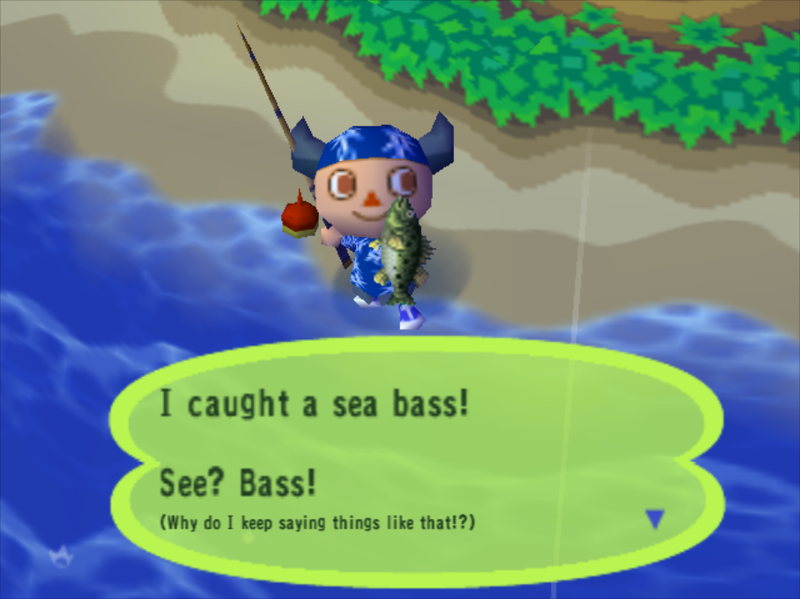 I remember summer days when I would change the date to make it rain in the game, often when it was also raining in real life, and just go fishing on the beach. I would try to catch Coelacanths (which appear only when it is raining), Barred Knifejaws and Red Snappers, fetching 15,000, 5,000 and 3,000 bells respectively. All 3 of those species appear in the ocean, but if you catch a Sea Bass, put it back! It’s a waste of inventory space! I paid at least one considerable loan by selling fish to the raccoon. One weird thing about these games is that you can catch frogs the same way you catch fish, but there can also be frogs living in your town. 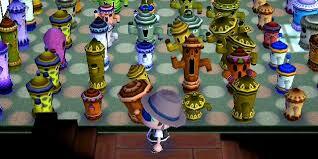 One day my friend showed me how he had been cheating in Animal Crossing. He had an Action Replay and was able to use it to create any item he wanted in the game as well as obtain infinite money. He had me visit his town and wanted me to participate in a makeshift lottery game that he had set up, the prize being money he had created using the cheating device. 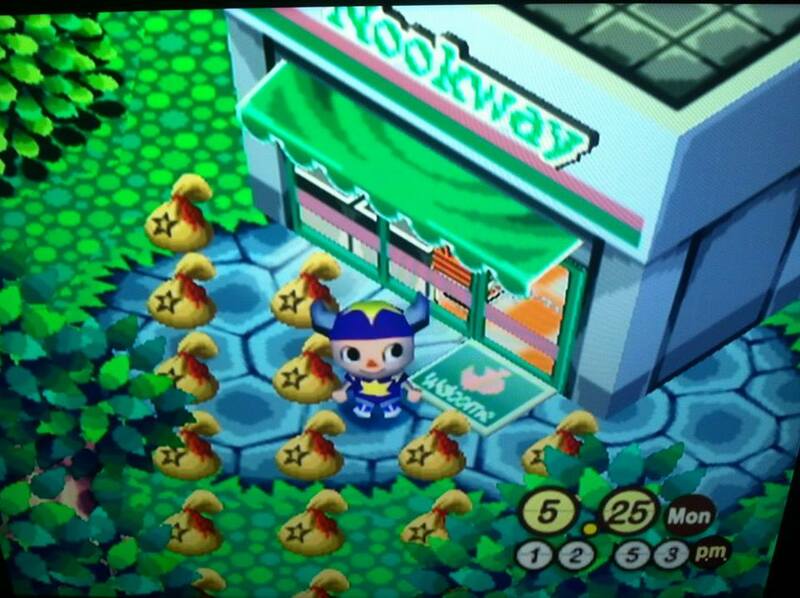 I was annoyed because to me it seemed that the point of Animal Crossing was to work to make money. By accepting the cheated money, it would be the same as if I was cheating, so I refused. What puzzled me, however, was why my cheating friend bothered to play Animal Crossing at all given that he was cheating. 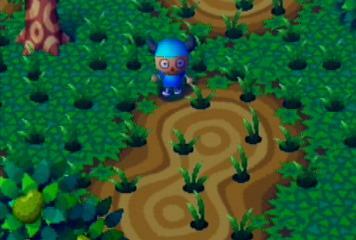 This is when I started to consider the actual game of Animal Crossing to be somewhat stupid. I was in middle school, which is when a lot of people judge some of their old hobbies more harshly than they should. I stopped playing for a very long time, assuming in my little mind that I had finished upgrading my house and paying off my debt. My opinion of Animal Crossing changed and changed back as I matured. I played the DS sequel quite a lot, but I stopped playing that too after a few months. It inspired this riddle. What is forgotten and full of weeds? Your Town in Animal Crossing! Having read the Iwata Asks about Animal Crossing: City Folk, I played a bit of it after its price dropped to $20, but I couldn’t really get into it maybe because I knew I didn’t finish paying off my debt in the DS Animal Crossing. It wasn’t until I mistakenly added Animal Crossing to my list of beaten games (thinking that I had paid off my debt to Tom Nook) that I rekindled my interest in going back to finish the other Animal Crossing games that I had started. 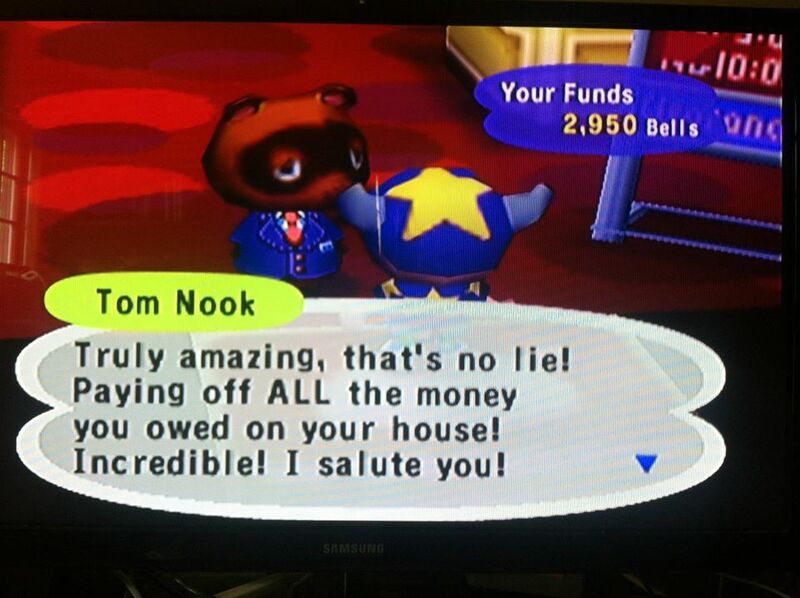 I consider an Animal Crossing game to be beaten if 1: You fully upgrade your house and pay off your debt to Tom Nook, 2: You do everything else you want to do in the game. 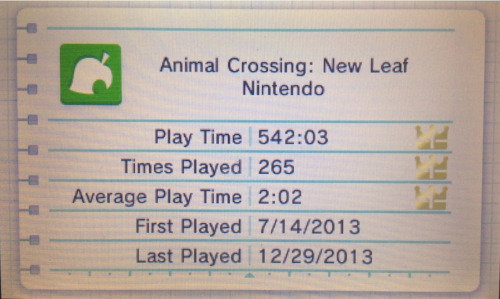 It’s pretty open ended, but you’d be a fool to attempt to really 100% an Animal Crossing game, unless you really feel passionately about it. 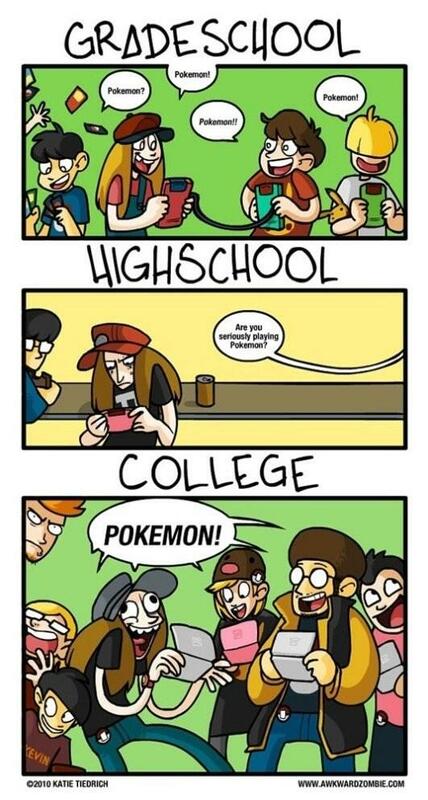 It’s a game that can take over your life because you typically have to play it every day if you don’t want to miss out on things in the stores and stuff like that. 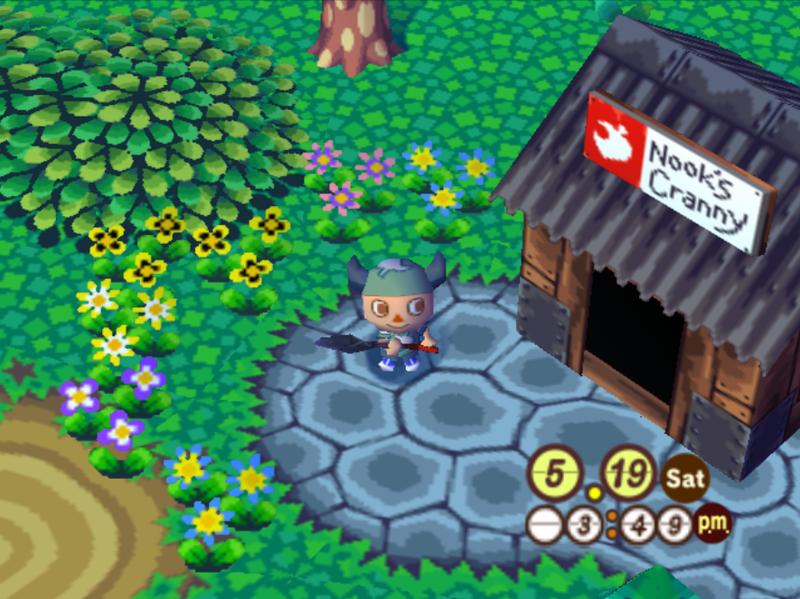 I eventually found the memory card for my old Animal Crossing town, and I decided to visit it. My friend Cameron brought over his disc since mine (probably Jonah’s) wasn’t working. It was then when I discovered that I hadn’t really finished upgrading my house and paying off my loan, so I got straight to work continuing my game where I left off, possibly a decade before. I wonder if there are other games on my list that I haven’t technically beaten. If it could happen once, it could have happened again. I suppose the only games I’m not 100% sure that I beat are Pokémon Red and Blue, but I think I made a point of completing both of them before I got Crystal Version. Gotta bring in the bells! 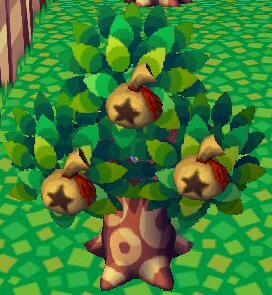 When I found out about my miscalculation, I had been on a roll in the other Animal Crossing games, finally perfecting my technique for planting the maximum number of foreign fruit trees in a single town and destroying every other tree. 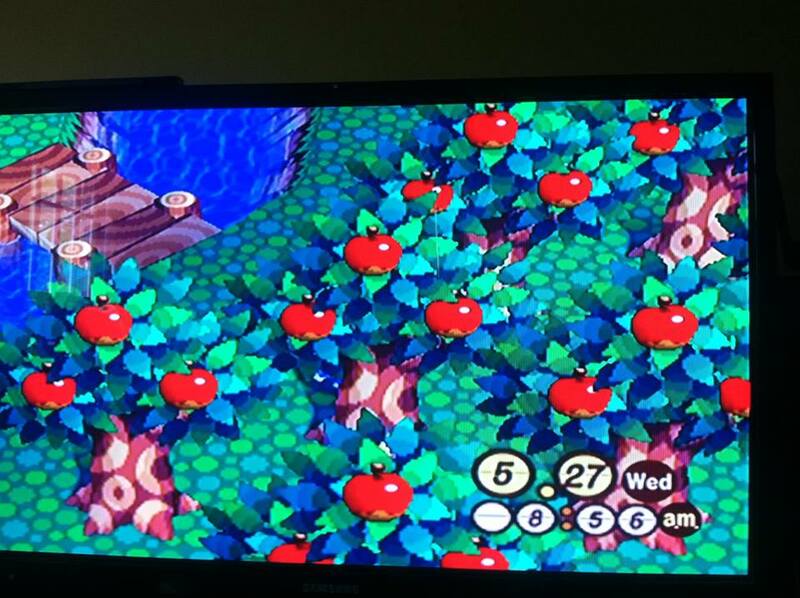 I believe there was at least one Apple Tree growing in town, so the first thing I did was buy as many axes as I could from the catalog (which can only be done prior to the DS version) and as they arrived, I chopped down every tree besides the apple trees. I also expanded the orchard of apple trees, using every grown apple as a seed for the next tree. I also planted money trees whenever I could. To plant a money tree, you need to find a spot on the ground that has magical light shining from it. You have to bury a bag of bells in the golden spot, but it can be risky. If the tree is planted in a bad spot, it might not grow to replace the money it took to plant it. If it does grow and a bag of 30,000 bells was planted, the profit is 60,000 bells. “Money Doesn’t Grow On Trees.” At Least That’s What They Say, But What About That Money Tree I Saw The Other Day? I continued the expansion of my apple orchard until my Microsoft Excel sheet indicated that It would take more effort to plant more apple trees than to just wait a few days and sell every apple that grows in that time to finish paying off the debt. 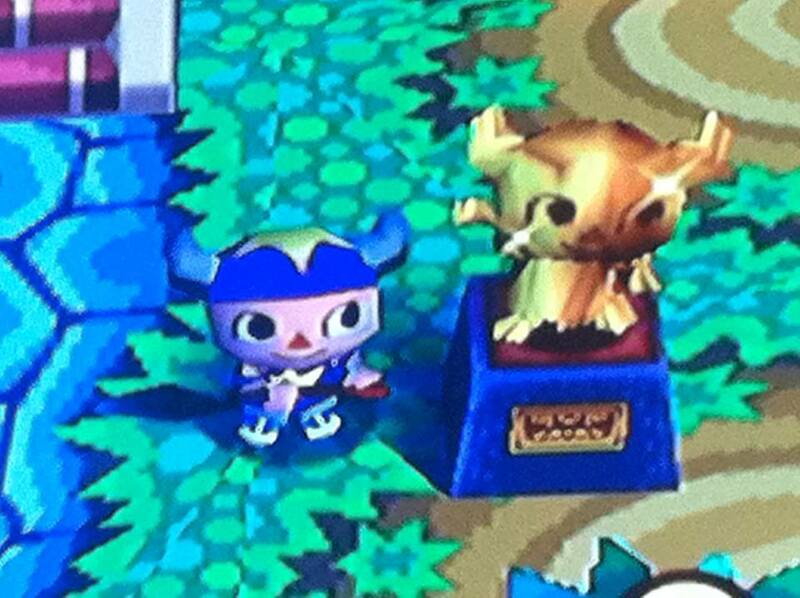 In the end, Nook gave me a golden statue, and thus I beat Animal Crossing for GameCube. 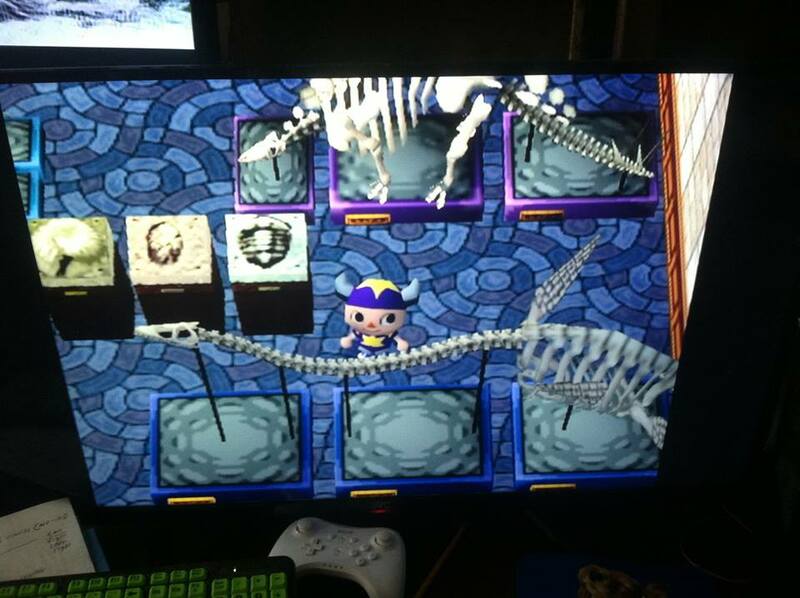 Along the way, I actually did succeed in finishing the fossil collection at the museum. 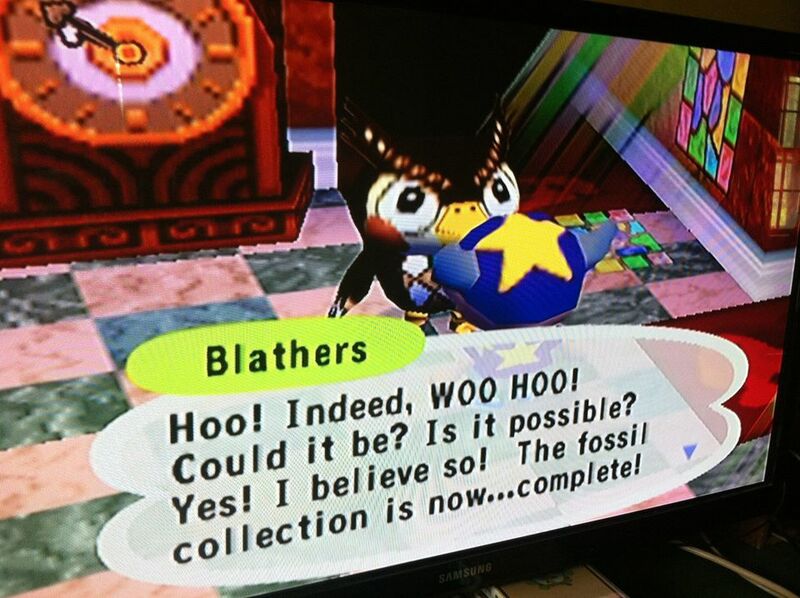 That is something I felt pretty good about since it was one of my favorite parts of Animal Crossing. 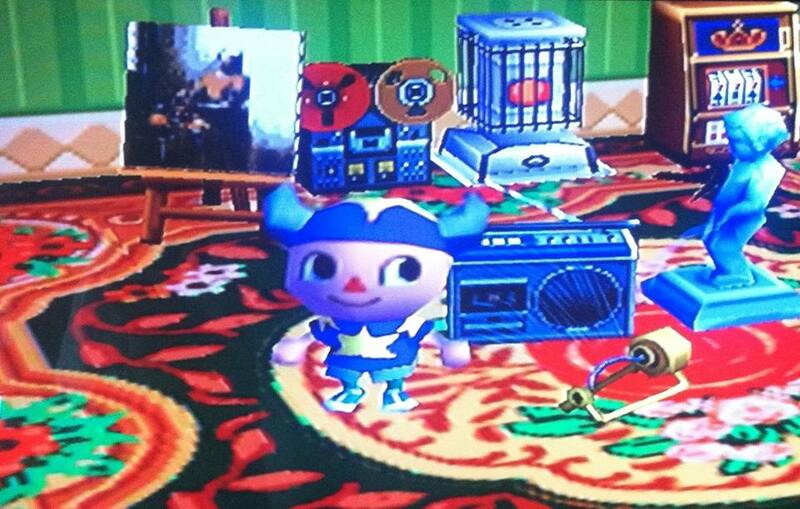 And here’s my Animal Crossing house, Assassin’s Creed Logo included. I simply call this image “AC”. This monstrosity can be found upstairs, made from some of the extra fossils I didn’t sell. Apparently electronics can get wet in this game without malfunctioning. This is my basement. I like this room. 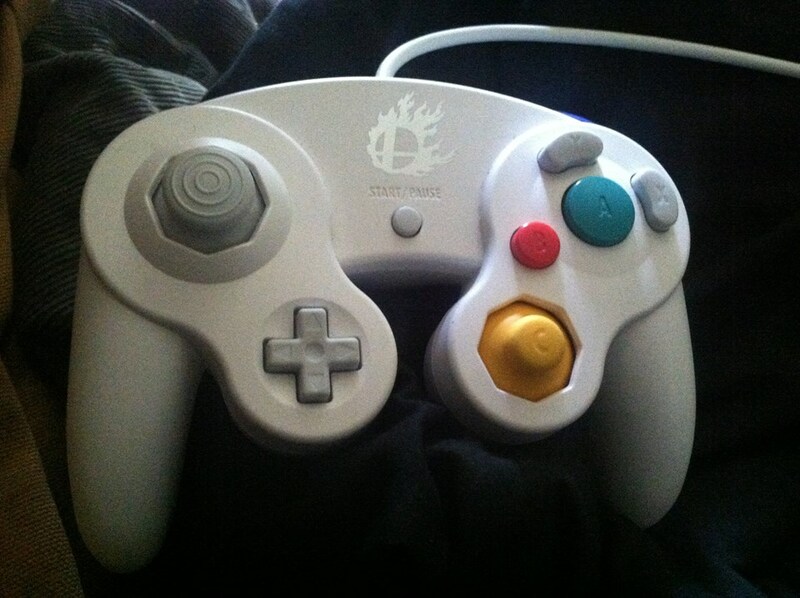 The 2015 portion of my gameplay was performed using this Super Smash Bros. GameCube controller. 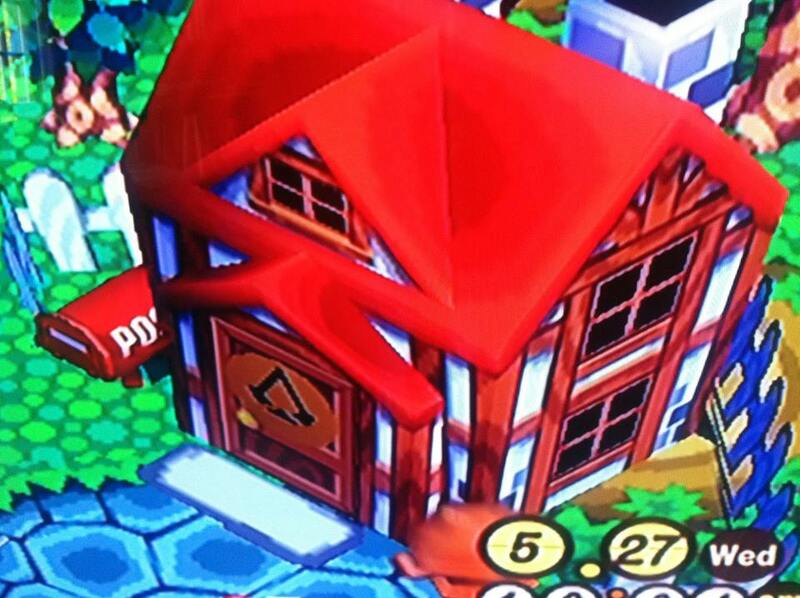 After all, Villager is a Smash character now. The passage of time in Animal Crossing makes the town feel like a living breathing place set in a virtual reality even though it’s really just a computer program. That’s why it can be interesting to come back after years have gone by, even only for a visit. Is your town full of weeds?